After reading your article regarding E-Cigarettes in the Morning Call I decided to write to you to express my opinion on the matter. I recently purchased an E-Cigarette (approximately one week ago) from another vendor. I have read an article about the FDA’s concerns regarding the E-Cigarette and I would like to share with you some feedback from a user of this product. I have noticed that as I have used the E-Cigarette more my consumption of traditional cigarettes has decreased by approximately 50%. I notice that I take less drags from the E-Cigarette than I would from a normal cigarette when I experience a nicotine craving. Physically, I have felt an improvement in my lung capacity and also have not felt as congested nor have I coughed in the morning as I have with traditional cigarettes. I would consider this to be beneficial. I am not qualified to make a scientific statement by any means, I can only relate how I physically feel. I am quite aware that smoking any product is a risk to my health, but as a consumer free to choose and of my own free will, I have assumed this risk. I am hoping that over time I will be able to fully switch over to the E-Cigarette, possibly as a means to quit (some manufacturers even offer no-nicotine cartridges which can then, I believe, be used cessation product if you choose to do so) but most definitely to reduce my consumption of cigarettes. As I am sure you are aware, a cigarette addiction is difficult to deal with and indeed extremely hard to break. The government has continually expressed sentiments that it would like to help people stop smoking, and I believe there are many who say that and truly wish to help. However, as I’m sure you are aware there are a few developments that I wish you would have considered in your article, or that you may want to consider in a future article. The first, is that in the legal case between Smoking Everywhere and the FDA, the lawsuit was filed back in April and key to the case being presented by Smoking Everywhere was the fact that the FDA had no authority to regulate tobacco. That has subsequently changed as a result of legislation earlier this year. Also included in that legislation was a massive tax increase on tobacco products in order to generate revenue for the Federal Government. The use of E-Cigarettes, which are not subject to the federal taxes under the provisions of this law, results in a loss of revenue to the Government, which makes them biased in nature when deciding on this matter. It is a fully informed consumer who should be allowed to make decisions and not be subject to decisions made by a party who stands to gain financially by impairing the competiveness of another entity. I understand that cigarette smokers are not exactly sympathetic figures in our society. Once again, however, I would like to remind people that nicotine is highly addictive. I find it condescending then, that public figures express statements of sympathy to smokers, while raising the taxes on smokers, who by the addictive nature of the products, are forced to pay these ever higher prices due to the nature of the addiction. I am sure many are aware that these are also the tactics of narcotic drug dealers, who victimize those who have fallen victim to addiction. I do not find honesty, then, in the statements of those who say they wish to help smokers quit using the products, knowing that the individuals are addicted to the products and will, of course, be forced into paying more and more money while at the same time providing no material services to helping people quit. If this were the case, would it not make more sense that the most sizeable portion of the tobacco taxes go into services for smokers, to help them quit, to provide for their needs, rather than to be steered away from them? I would also like to make notice of highly disturbing article I had read in another Pennsylvania newspaper online. I do not recall which newspaper this was, but it spoke of the budget crisis in Pennsylvania and with regard to those facing the impeding prospect of losing their unemployment benefits as the maximum time frame looms. I can only imagine the hardships facing these families are facing, and I understand that in this economic environment this can happen to any of us. I found it extremely disheartening and callous that a Pennsylvania official felt necessary to state that the Commonwealth will be hit hard if these people were to stop buying tobacco, alcohol, and lottery tickets resulting in an additional drop in revenue to the Treasury. I would like to thank you for your work covering this story and presenting the opinions of both sides in your discourse. From a user of both the E-Cigarette and traditional cigarettes, I simply wanted to convey my thoughts on this matter. I intend to keep using the E-Cigarette and to at some point use them as a complete substitute to traditional cigarettes while moving to ever lower doses of nicotine until I am not using nicotine at all. It is not the manufacturer’s intention of these products for them to be used as a cessation device, however, I intend to try to use it as such. Should I fail in stopping the use of nicotine all together, I believe this to be at least somewhat less dangerous than traditional cigarettes. Should I succeed, then I will be extremely happy in having achieved this goal. I will continue to strongly urge people who have not smoked to never do so, to remain tobacco free. As for me, I am dedicated to trying to stop smoking altogether by using whatever means are available to me, an informed, educated consumer. Has the Administration Gone Insane? White House Chief of Staff Rahm Emanuel told The New York Times Obama intends to use the news conference as a “six-month report card,” to talk about “how we rescued the economy from the worst recession and the legislative agenda moving forward, including health care and energy legislation. That according to Obama budget director Peter Orszag, who is incapable of producing budget numbers before Congress leaves for recess. Also, he says that it’s consensus that private economists are saying that the US will have positive economic growth by the end of the year. Yet almost all indicators I’ve seen and all reports I’ve seen equates to the possibility of a slight uptick in GDP and no reduction in unemployment until 2010. Don’t think for a minute that they don’t know that everyone is going to get hit with a tax increase in 2010 unless they extend the Bush Tax Cuts. The money that will be leaving the private sector will also harm the economy right about the time that it’s supposed to be recovering and we still have not yet figured out a way to pay the $787 billion Obama spent on his “Stimulus” alone. He’s spent a great, great deal more than that already. That’s not saving anything at all, let alone an entire economic system. This is all about politics to them and that is unforgiveable. These are people’s lives we’re talking about and all they can do is lie and say that they’ve “saved” the economy? Are they on drugs? This is beyond dishonest. Obama even went on TV tonight to spew this garbage while telling you that because his policies on economics have went so well that you should trust your healthcare, your life, to be in his hands and the hands of the people who think that the economy is “fixed.” This is the their new meme, that they’ve “fixed” the economy, that they’ve “saved” us. This is our reality, Obama’s policies, in under six months, may have created a new natural unemployment rate that approaches 7% instead of what it has always been in the United States, 3.5%. Unforgiveable. This is, of course, under Obama’s assumptions that unemployment wouldn’t hit 9% and it currently stands at 9.5% and promises to rise above 10%. Net effect, the deficit is already going to GROW because his assumptions were so far off. He overestimated revenue greatly. He also neglects the fact that the CBO says his healthcare bill will increase the deficit by over $230 billion in the early years before ballooning in later years. Unbelievable. I wonder what he was offering the CBO head in that highly unusual meeting he called for after that report was published. You may also notice that he’s pushing so hard for more spending and yet, he cannot bring himself to release the budget numbers. Gee….I wonder why. “As a result of the action we took in those first weeks, we have been able to pull our economy back from the brink,” he said. When you know that the unemployment rate is going to keep raising, that the housing market is still lowering, that the stock market is stagnant, consumer confidence is down, wholesale prices and consumer prices are inching upward as we move toward higher inflation rates, one gets the sense that he has no clue what he’s talking about. In fact, the new liberal meme is going to be that Obama saved the economy and they’re going to pick and choose just a few economic indicators to try and sell the public on this nonsense. That’s all well and fine and very much needed, but we haven’t even leveled out unemployment and it’s going to keep rising over the next few months at least. So go tell that to people who are losing their jobs, their houses, who can’t afford to feed their families, or can barely make ends meet Obama. Despite all this you think people should trust you with another trillioin or so dollars to experiment with our health treatment? Has more than 30 days passed since you took office when you didn’t roll out another $500+ billion program? Stop the madness. 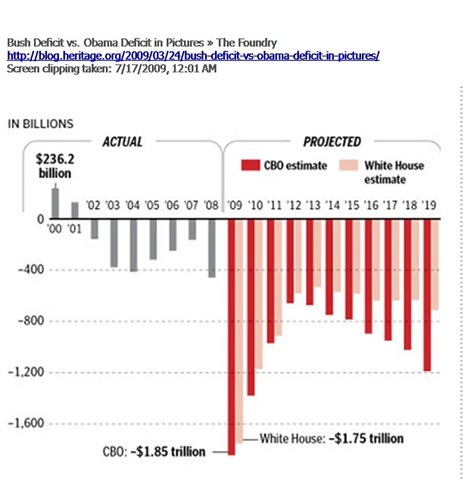 Here’s some basic math for you Obama: spending $787 Billion you don’t have is by it’s very definition creating a deficit. You do know we have to pay that back right? But I’m sure we’ll be OK with your 10% unemployment rate you’ve pinned on us. The market would have led us to recovery, you’ve lead us straight into an economic tornado. Just show that to a Liberal next time they screech about President Bush. Keep in mind this graph is old and the deficit is set to surge much, much higher in the face of growing unemployment, which the current Administration said would be much lower than where it currently stands if they were allowed their gigantic Porkfest. Result: Epic Fail, one we and our children will be paying for year and years to come. Second point to keep in mind here, this does not account for the ginormous deficit expansion that will result if the Healthcare bill is allowed to go forward. This is disastrous. The same facts apply to the following graph from the non-partisan CBO. By the way, they also blasted the Democrat’s Healthcare Proposal. Notice the enormous spike in in 2009? 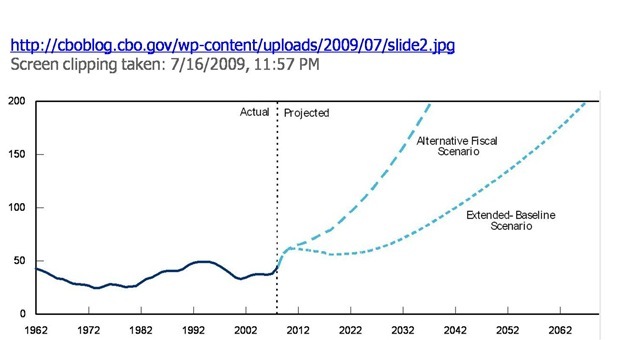 The graph represents the expansion of debt under CURRENT law, so any and all spending proposals the Dems are set to unleash will push this monstrosity higher, and even more rapidly. This mindless spend, spend, spend philosophy has already put a crushing burden on our backs and it truly is mindboggling just how much money Obama and his allies on the Left have spent is just 6 months. They’re already talking about ANOTHER STIMULUS. Oh yea, that’s right, for those of you who are Orwell fans, you’ll be pleased to know that Obama never said his horrific kickback spending plan was a Stimulus, but merely a stabilizer. Hot Air’s all over this one. You can see where this is all going. It’s bad enough most of our elected officials have no concept of economics; they apparently have no concept of basic mathematics or ethics either. It didn’t take long to run into an “uh-oh” moment when reading the House’s “health care for all Americans” bill. Right there on Page 16 is a provision making individual private medical insurance illegal. How’s that for a teaser? Read the whole thing, OK, now I’m pretty much begging you to and this is one you should probably send in emails to your friends and family and encourage them to send it around as well. Once again we’re seeing Liberals lie and spit in our face as they try to ensure Government take over of the healthcare industry and initiate rationing which will result in lower quality care, higher mortality rates, loss of freedom, higher unemployment rates, and higher deficits. Under no means can we allow this bill to pass. Awesome video where Barbara Boxer gets exposed. Mr. Harry Alford did a wonderful job showing restraint in his exchange with Boxer. If I were him, I am certain my reaction would have been a bit more harsh, so kudos Mr. Alford for calling Boxer out and for showing restraint in doing so. The follow up interview is here. Mr. Alford is absolutely correct in his arguments concerning energy debate and with his call for an apology from Boxer, especially his call for an apology from Boxer, but sadly I fear he probably won’t get either, but at least this man stood up for all Americans today and he should be commended for that to the highest degree.